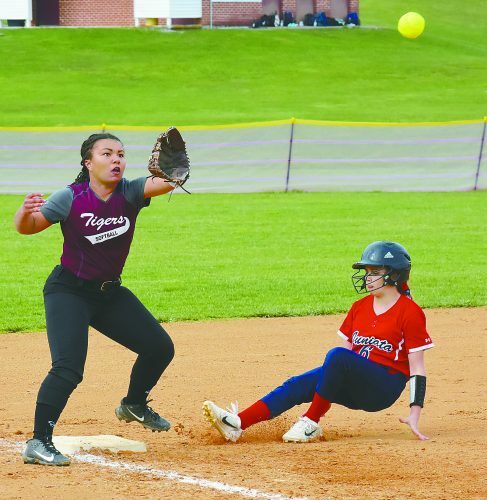 MIFFLINTOWN — On Friday night, Juniata found itself stuck in the middle, both in its game against Susquenita and in its season. The Blackhawks used a power running attack to wear down the center of the Indians’ defense in a 28-14 victory for Susquenita, which put Juniata squarely in the midst of a disappointing 0-3 start to the schedule. Juniata showed flashes of capability offensively, but the final play of the first half served as a microcosm for the Big Red’s season. In a tie game and facing third-and-goal from the Susquenita 4 with about eight seconds remaining, Indians quarterback Jeremiah Parson was flushed from the pocket and fired a strike to Ty Martin near the pylon. Martin made the catch, but was ruled to be down inches shy of the goal line — and in bounds — meaning time ran out on Juniata before it could call its final timeout. Instead of one more shot at the end zone from a gnat’s eyelash away or a short field goal — either of which would have given Juniata the halftime lead — the home team was again frustrated in a season with already more than its fair share of it. 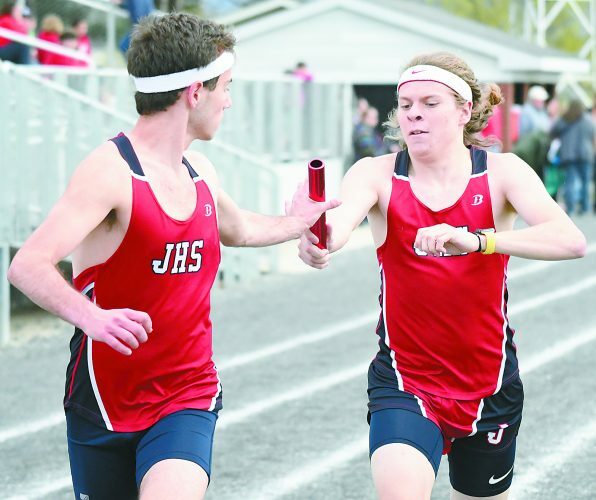 During the game, each time Juniata seemed to claim control, the Blackhawks would respond in kind. After a scoreless first quarter, the Indians finally broke the ice in the second period as Parson connected on a beautiful toss that hit receiver Steven Ranck in stride along the left sideline for a 33-yard touchdown. But the lead only lasted as long as Susquenita’s next drive. Brett Sanchez capped off a nine-play march with an eight-yard run up the middle to tie the score. Despite the disappointing end to the first half for Juniata, it managed a solid start to the second half. Susquenita opened with the ball, but had second-and-25 pass intercepted by Ranck. Four plays later, workhorse tailback Ethan Grove broke through the line and raced 71 yards to a touchdown that gave Juniata a 14-7 lead. But again, the Blackhawks answered, this time just 1:40 later as Sanchez again found the goal line from eight yards out on a keeper to tie the score. And the quick offense continued for Susquenita on its next touch as it went 62 yards on four running plays — the final one an 11-yard power run by Austin Kenny to give the visitors a 21-14 lead through three quarters. Attrition continued to add up for the Indians defense as not only did Susquenita make it three straight scoring drives when an all-run 12-play sequence in the fourth quarter was capped off by Kenny’s second touchdown run to deliver the knockout blow and set the final, but several players were dealing with cramping issues as well. Juniata’s last-gasp effort ended when Parson was intercepted by the Blackhawks’ Cohen Bitner inside the 10-yard line with less than two minutes to play. Juniata (0-3) visits Line Mountain on Sept. 14 in what will surely be another tough game for the Indians. J–Ranck 33 pass from Parson (Esh kick), 8:22. S–Sanchez 8 run (Miller kick), 4:13. J–Grove 71 run (Esh kick), 6:39. S–Sanchez 8 run (Miller kick), 4:56. S–Kenny 11 run (Miller kick), 1:59. S–Kenny 5 run (Miller kick), 5:24. RUSHING: S–Sanchez 20-121, Kenny 14-124, Garcia 5-12, Stump 1-13, TEAM 1(-1); J–Grove 10-114, Parson 12-25, Tr. Martin 7-21, Ty Martin 4-15. PASSING: S–Sanchez 2-6-1-36, Garcia 2-3-0-24; J–Parson 8-16-1-107. RECEIVING: S–Miller 2-32, Stump 1-17, Harbold 1-10; J–Grove 4-18, Ranck 2-70, Ty Martin 2-19.